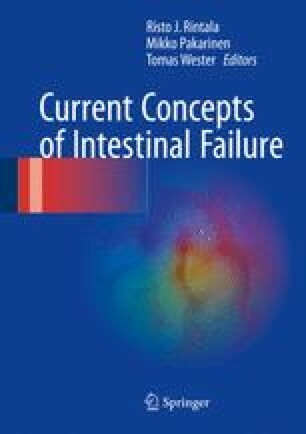 Intestinal failure (IF) refers to all states where the intestine has inadequate absorptive capacity to meet nutritional, fluid, and electrolyte needs to sustain life and growth requirements of a child. IF leads to chronic dependence on parenteral nutrition (PN) to maintain adequate growth, hydration, and micronutrient balance. The etiology of IF recognizes the short bowel syndrome (SBS) where congenital or acquired lesions have determined extensive loss of intestinal mass, as the most frequent underlying IF disease. Malabsorption due to ineffective mucosal surface or motility disorders is a further cause of IF. Nutritional workup of pediatric IF is usually complex; the key concept of the overall nutritional care is to integrate the maximum tolerated amount of enteral intake with the ongoing support of PN. The final objective is to achieve total or partial intestinal rehabilitation according to the etiology of IF. The nutritional care of pediatric IF includes the following steps: (1) early managing of fluid and electrolyte losses before starting PN and enteral nutrition (EN); (2) providing adequate PN, for growth and normal development; (3) promoting intestinal rehabilitation by optimizing EN; (4) discharging on home parenteral nutrition (HPN) the patients with predicted long-term PN; and (5) preventing/treating complications related to the patient’s underlying disease and their PN. IF outcome is significantly improved if it is managed by a multidisciplinary team that allows for fully integrated care of inpatients and outpatients by favoring coordination of surgical, medical, and nutrition management. Pittiruti M, Hamilton H, Biffi R, MacFie J, Pertkiewicz M, et al. ; ESPEN. ESPEN guidelines on parenteral nutrition: central venous catheters (access, care, diagnosis and therapy of complications). Clinical Nutrition. 2009; 28: 365–77. doi: 10.1016/j.clnu.2009.03.015. Epub 2009 May 21.